Decario's Strike Cruiser dropped out of the warp into the outer rim of a system on the edge of the Eye of Terror. 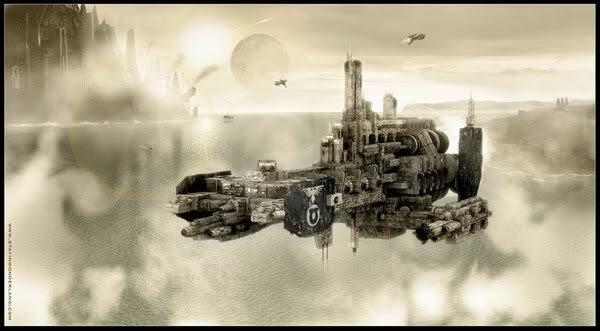 On order's from the Relictor Chapter Master Artekus Bardane Librarian Decario had taken a scouting fleet and followed Typhus and the Terminus Est to this backwaters system. 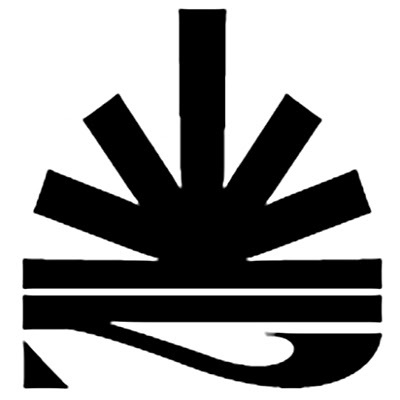 The bridge of his flag ship shuddered as they fell back into normal space. "Navigator, get the fleet behind that moon." Decario ordered his helmsman. 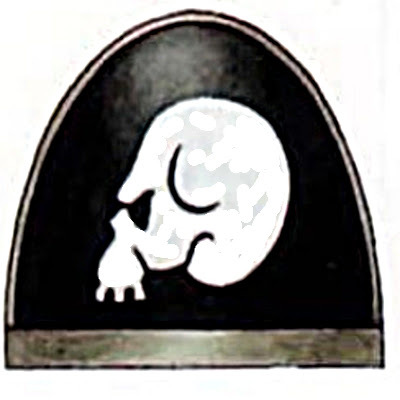 "Tech Marine Cossus, scan the system for any signs of the Terminus Est." Cossus quickly worked the controls. "There is no sign of her, Librarian." The Tech Marine Responds. "But it appears the rumours are true. This system is swarming with Eldar. If they have noticed us, they have not responded." Decario looked at the sensor screen illuminating the Tech Marine's face. It was odd that the Eldar were not defending their territory but it would be foolish not to cease the opportunity. "Bring the fleet behind the furthest planet. We will observe." For three weeks Decario's fleet hung in orbit around the nameless Eldar world as they observed the sparse movement of the Eldar between the planets and attempted to break their codes. Finally the Tech Priests were able to decipher the repeated messages coming from the surface of the planet they orbited. The Eldar were begging for aid. 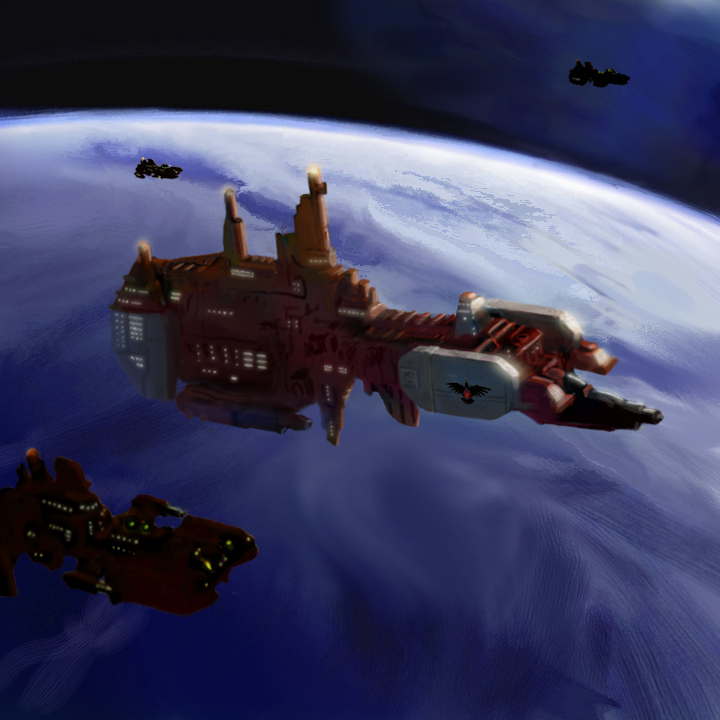 This planet had been overrun by Plague Zombies, which had damaged most of the batteries leaving them helpless against yet another threat, a Space Marine fleet in orbit. They were moving a power cell to activate their last functional battery and needed reinforcements. "Have Chaplain Vekio assemble a team to recover that power cell." Decario ordered. "The Eldar know we are here, let's not let them activate that battery." 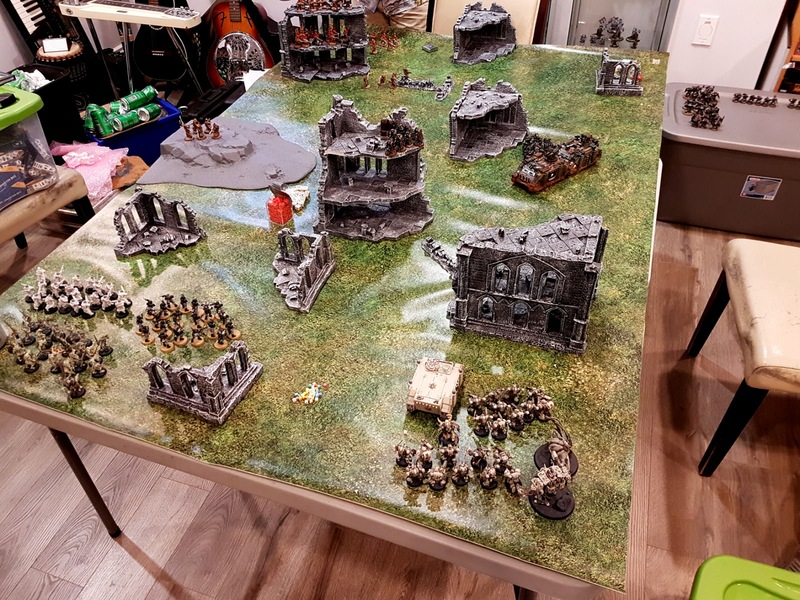 For our 2nd Three Way Battle we each came back to the table with revised and much larger armies. We agreed upon 1500pts. and to this time play the Relic mission from the Rulebook. There was a single objective marker on the table: Which we called the Orbital Battery's power cell. The last player who's squad control's the Power Cell at the end of the game wins. It was the perfect fit for our scenario. For this game Ivan played as his Relictors a built what he called a "scouting force". Wesley Controlled the Eldar Force, which we spent some time discussing and agreed the Lugganth were the best match, and we also agreed that they need a cooler spelling for their faction name, so we will be calling them the Lug'an Ath. My Death Guard force was drastically rethought and brought into the 8th Ed using the Pox-Walk-a-Tron strategy that you can easily find the details of online. The Forces were in place and the battlefield set up. It was time for Vekio to land his scouting force and claim his prize. The Chaplain followed tracked the power signature of the power cell as the Eldar transported it across the planet, and landed his force in front of their path. Soon, the Wave Serpent carrying the Power Cell came sailing out form the behind the hill, unaware of Vekio's Force lying in wait. The sizzling crack of a lascannon beam burst from one of Vekio's Razor backs. The Red hot energy sawed the left side of the Wave Serpent clean off. The craft came plummeting from the sky, ejecting its cargo as it fell. Vekio turned to his Scout Sergeant. "Sergeant Faustus." Vekio ordered. "Recover that Power Cell. We will support your withdrawal if needed." Faustus saluted and left with five other scouts travelling into the forests. For days as he had traveled with Vekio's detachment Faustus had mapped the lush forests of this world and studied the ruins scattered throughout this planet. He had come ot the conclusion that this must have been an imperial planet at some point and had fallen to the Eldar. But that was so long ago so that now only these ruins remained. The Wave Serpent had jettisoned its cargo into the center of a ruined city, over grown with grass and weeds. Faustus' sensors reported that the ruins were once again a war zone as Eldar forces desperately fought off wave after wave of Pox Walker Zombies. But there were mroe then just Zombies here among the shuffling hordes Plague Marines, and Bloat Drones moved and weaved their way towards the enemy. They had found their prey, but first the power cell. Faustus tracked the fallen power cell to the top of one of the buildings on the edge of the fighting. It had landed on the top floor of the dilapidated building and Faustus felt assured that he could recover it and depart unseen but he would have to move quickly. The battle between the Eldar and the Death Guard was already shifting in that direction trapping him and his scouts between them. Quietly and unseen Faustus' party crept along the battle's edge and to the top floor of the ruin. There the power cell lay undamaged just by the roof's edge. Faustus ceased it, but as he moved to depart the building, the ground shook and the air rippled with gun fire. The battle had swept over his position in the ruins Faustus was trapped as he had feared! Radioing for aid he hunkered down and waited for the Vekio to come with his promised Support. The Poxwalkers and corrupted Eldar Cultists clambered out of the ruins. At first as Faustus peered through his rifle scope, he thought that was perhaps that was it. Perhaps the Eldar had managed to hold back the tide reducing the Death Guard to a smattering of mindless zombies and easily frightened cultists. But soon the dull buzzing of Bloat Drones, and the sickly smell of decay blew in Fasutus' direction, and a small detachment of Death Guard lead by a Sorcerer moved into view. 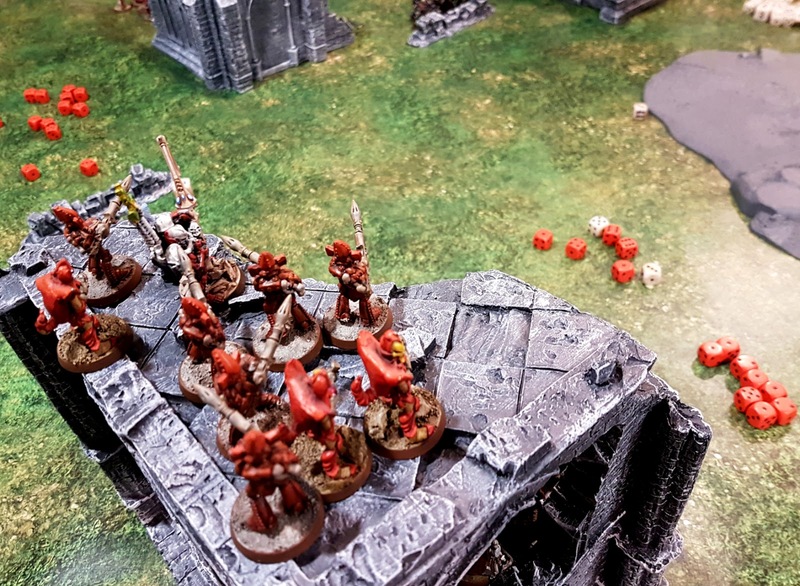 On the other end of the field, Eldar Rangers materialized into positions scattered across the map, and a squads of Dark Reapers took position in one of the ruins poised at the Poxwalkers. Faustus hoped for a moment that he and his initiates could weather the battle atop this ruin unseen, when hex vox caster flared. "Faustus we are closing on your positon." 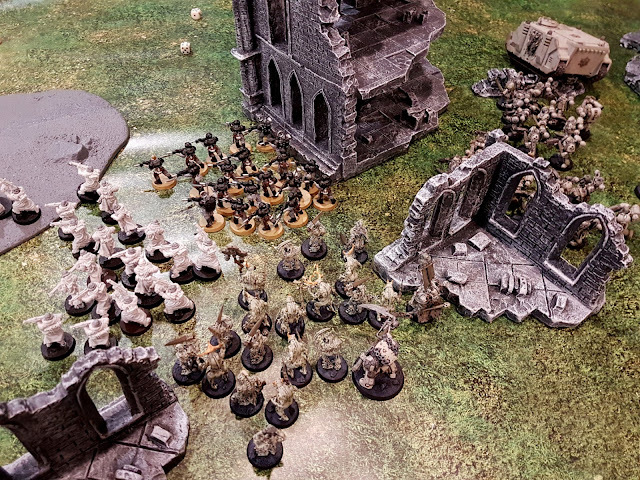 Veiko's voiced crackled over the vox, attracting the attention of one of the Death Guard below, as two Razorbacks burst from the forest around surrounding the ruins, and scout bike engines roared onto the field. Any hope of leaving unscathed was dashed before Fasutus' eyes. 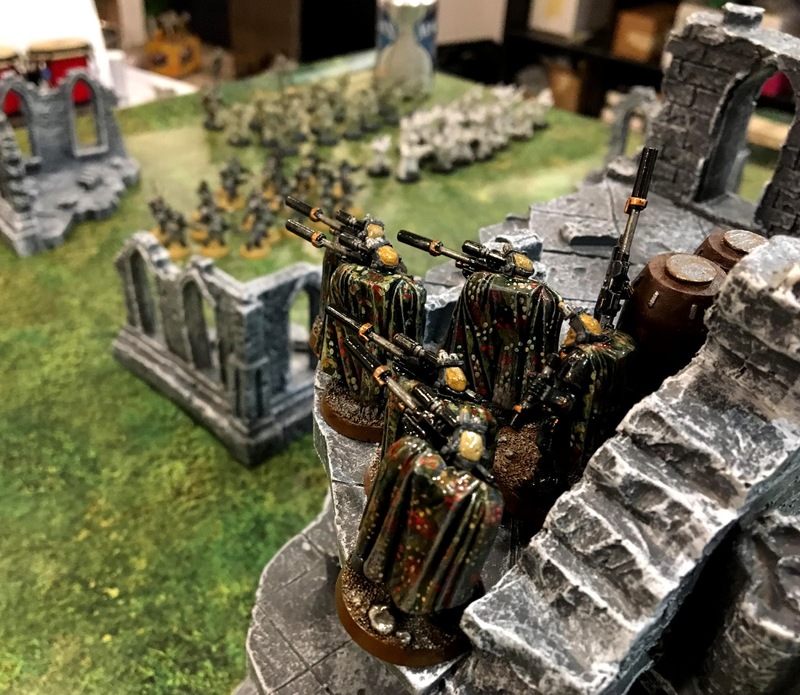 Faustus dropped down from his position on top of the of the ruin, taking fire from Cultists of Nurgle the entire way down. If he could get his scouts to the safety of the Razorbacks, he could recover the power cell and get the hell out of this cursed place. Faustus and most of his scouts made it to the ground and around to a covered position on the far side of the building away from the Pox Walkers and Cultists. The Razorbacks were only a a few dozen feet from here, and it wouldn't be long until they could reach safety. However as the APCs came into view the Dark Reapers on the ruin opened fire, showering them with a devastating curtain of missile fire. The safety of the Razorbacks was replaced with hell fire and smoking wreckage. Without options, Vekio fired at the Dark Reapers, but even with his scope their position in the ruins obscured his shots. The Scouts bikes roared across the field charging at the Dark Reapers, thirsty for vengeance and glory. 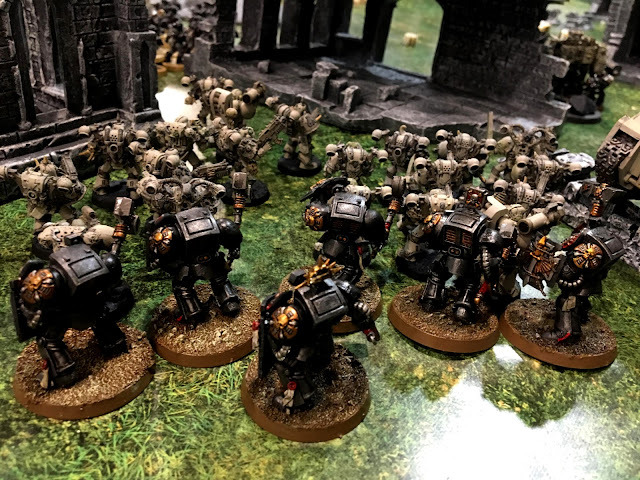 But the terrain was rough and the the scouts found themselves weaving among piles of rubble, and caught int he open when the Dark Reapers opened fire again. Another storm of missiles erupted from the ruin and when the dust settled no biker still rode. On the other side of the field, the Death Guard began their slow advance, engaging with Eldar Rangers, and the Space Marines that survived the destruction of the Razorbacks. A group of the Space Marines had managed to reach Faustus defending his position with some bolter fire, but the sizzling of a successful teleport signaled Typhus' arrival and the buzzing of Bloat-drones drew nearer. Faustus was beginning to feel he might not make it out of this one. Vekio waited near by in the forest a few kilometers from the front, and watched the battle on a holofield as his force was bombarded by Dark Reapers and shredded by Cultists and Daemonic Engines. He had to act quickly. Having kept his melee specialists in reserve, he ordered his Assault Marines lead by the Chaplain Proculus to strike, while he and his Terminators returned to the Teleportarium Chambers and redeployed onto the field. 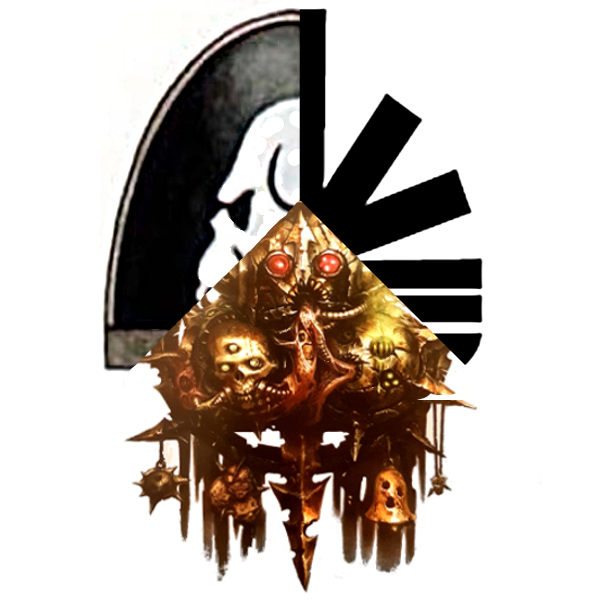 The plan was simple: the Assault Marines would tie up the Dark Reapers and he would lead the Terminators and dismantle the Death Guard Force; striking from behind. Quickly the plan was laid into motion and and Proculus dropped from his position in clouds. However, he had miscalculated and landed too close to the Dark Reapers. 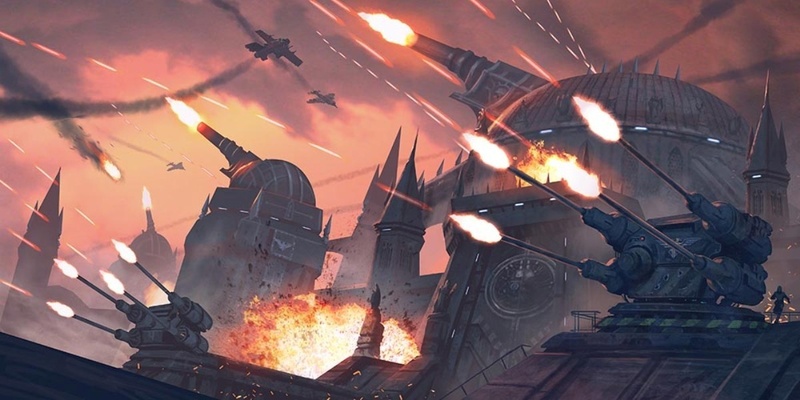 Using their superior reflexes the Dark Reapers turned and blasted the the Assault Marines as they descended from the skies. With his squad dead around him, Proculus managed to make it to the safety of the ruins only to be corned killed by the same Reapers that his men had fallen to just moments before. Vekio's strike fared better tearing into the Death Guard force's flank and halting the advance of the marines supporting the weaker Pox Walkers and Cultists, but not before Faustus and his defenders fell to the festering blades of a Bloat-drone's Fleshmower, that dropped on their position from behind yet another ruin. Faustus fired his rifle in vain as the spinning columbine ripped him from the ground and pulverized him into mush. The surviving Space Marine made a desperate dash to recover the the Power Cell, pulling it out of the Bloat-Drone's range. Vekio's Gamble had been costly, but it had paid off. The Death Guard could no longer take the Power Cell from him. Victory seemed assured: but it was sort lived. 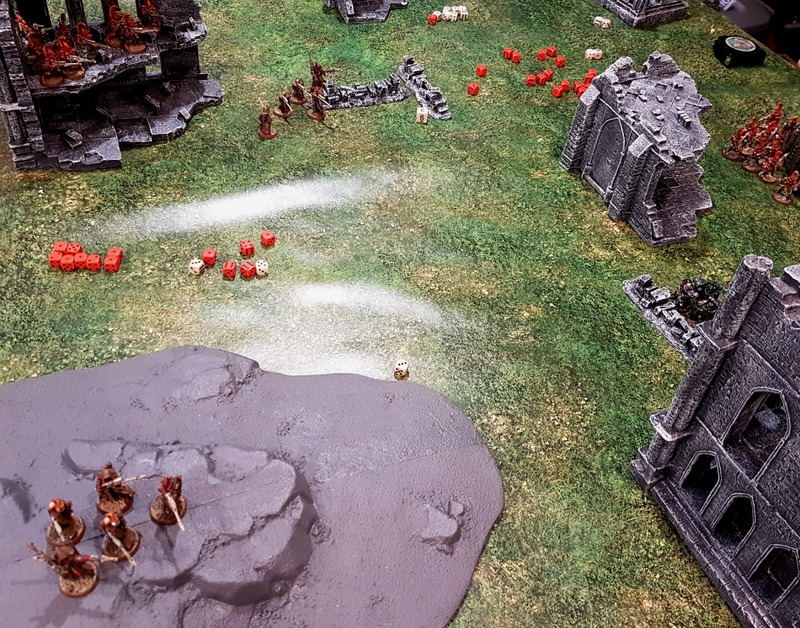 A sparkle of the Webway opening illuminated the area by the Marines, and a group of Eldar Wraithblades lead by a Warlock surged forward cutting the the defenders to ribbons and claiming the power cell for themselves. With his force destroyed, Vekio raised his Warhammer and smashed his way towards Typhus giving a mighty battle cry. The Plague Lord turned and gripping his festering Manreaper Scythe and swung with the skill of 10,000 year old veteran. The stroke was clean, and sliced easily through Vekio's Terminator Armour, as swarms of Destroyer Plague flies swarmed around him reducing him to a pile of rotten flesh and bone. As Vekio fell, the Dark Reapers realized the human's delaying tactics had given them a clean shot at the Host of the Destroyer Hive. Taking the opportunity, they careful aimed their Reaper Launchers at Typhus and rained missiles down on his position. As the smoke, cleared, no body or parts were found among the craters, it seemed Typhus had simply vanished. From his Striker Cruiser in orbit, Decario watched as Vekio fell and the Eldar Wraithblades recovered the power Cell and easily out ran the shambling Pox Walkers. "Tech Sergeant Cossus scan the planet's surface, for any batteries capable of threatening us." Decario barked at his bridge officer. "Scans show that there is an active system of batteries on the North Eastern continent. Perhaps 500 years old, and many of the weapons are none functional. However with additional power they would pose a threat to us and any fleet entering the system. The Eldar are certainly taking the power cell there." Decario nodded thinking about what to do next. "Postion the fleet on the other side of the planet and hold them there. Then launch Thunderhawks. We strike the batteries at dawn." Decario left the bridge heading towards his Strike Cruiser's reclusium. There are large stained plasglass window showed the heroes of the Relcitors now long fallen as the chapter had so many years ago. Decario stood there for a moment in silent prayer for those brothers that gave there lives in battle. But what was so important about this Web Gate that would attract the attention of Typhus himself? Who was that Sorcerer on the field with him? And what sort of resistance would the Eldar give if he tried to take their defenses from them? Too many questions, and this battle had yielded no answers. Faustus, Porculus, Vekios: they had all died in vain. Chasing what? And to what end? Decario shook his head. He had no time for philosophy. He had a mission to complete and everything has a purpose. So the Emperor ordains. And the Eldar win the first game of our campaign! They captured the Relic and held it at the end of the final turn. Me and my Death Guard came close, but in the end my Pox Walkers were just too damn slow, and those slippery Wraithblades just outran me. Our next game battle is one featured in the Battlefleet Gothic Invasion expansion where Decario will need to shut down as many of the Plantery Batteries as he can before the game is over. How well they do will matter for the following Battlefleet Gothic game were the Eldar will control those spaceward pointed weapons. 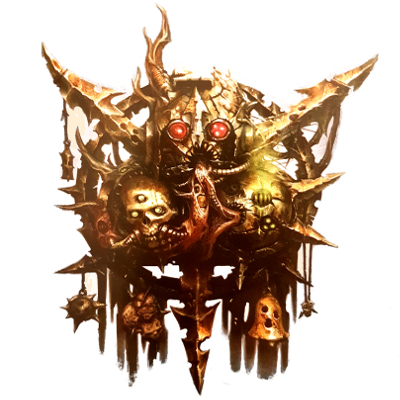 With Typhus defeated, the Death Guard will not feature in the coming battle, but they are still out there trying to gain control of this system and the Eldar Web Gate rumored to be located in the system. This is not the last you have heard of Typhus. And he will be back.